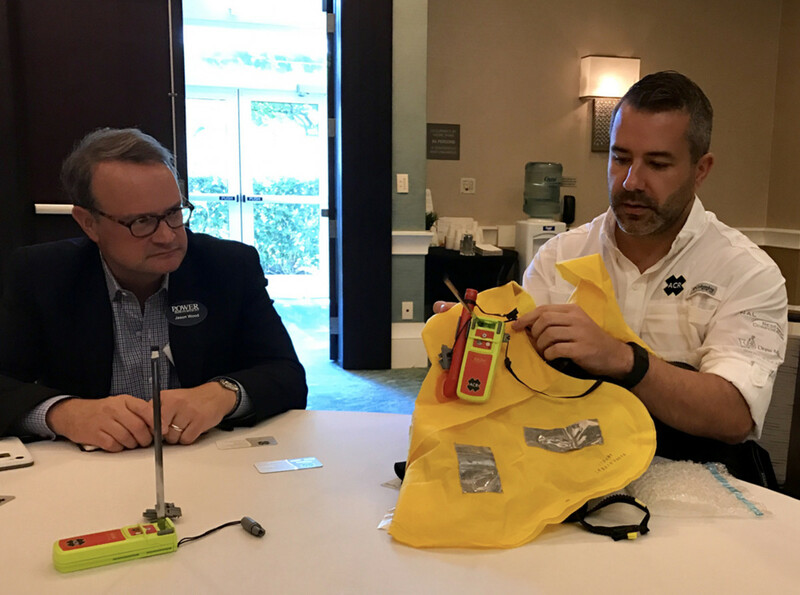 Mikele D&apos;Arcangelo of ACR demonstrates the company&apos;s new man-overboard device as Power & Motoryacht magazine&apos;s Jason Wood looks on. FORT LAUDERDALE — Active Interest Media’s Marine Group on Wednesday hosted a meet-the-editors day, giving companies a chance to talk about their latest products, marketing initiatives and the overall business climate in the marine industry. About 30 companies — covering segments such as propulsion, electronics, new boats, survival/rescue and marine accessories — met with a dozen editors representing seven of the group&apos;s marine publications. “As busy as the show is when it gets started, it’s a great way to visit with more than two dozen companies before things get hectic,” Soundings Trade Only and Anglers Journal editor-in-chief William Sisson said after the event at the Westin Hotel. Manufacturers took the opportunity to promote new products, identify their marketing direction and discuss story ideas and trends with AIM journalists representing Anglers Journal, Anglers Journal TV, Soundings and Soundings Trade Only, Power & Motoryacht, Sail, Yachts International and PassageMaker. The boatbuilders included Bertram, Grady-White, Sabre, the Marquis-Larson Group, Grand Banks, Ranger/Cutwater and Mag Bay. Electronics and communications companies KVH, FLIR and Navico were on hand, as well as marine accessory companies such as Airmar, Vetus Maxwell and Fusion. Bombardier Recreational Products talked about its Evinrude E-TEC G2 outboards. I attended nine sessions, starting with the new boat company Mag Bay. The California boatbuilder is promoting its 33-foot, stepped-hull center console as a tender, as well as a fish/day cruise boat, said Phil Bourque, vice president of sales and marketing. "We&apos;re still trying to get the word out about our product," said Bourque. "But we&apos;re changing that with a high-quality boat with top-notch craftsmanship and fit and finish." Bourque said a larger center console is on the drawing board. The company has six dealers and is building hull No. 14. Bertram Yachts CEO Peter Truslow and vice president of sales Tommy Thompson said the third Bertram 35 will be completed at the company&apos;s new Tampa, Fla., shipyard in about a month. Work is advancing on the planning, design and production of the Bertram 60, which is expected to debut in the winter of 2018. "The 60 gives a nod to the 54&apos;s design and is a stake in the ground in the bigger-boat market," said Truslow. Future boats will bridge the gap between the 35 and 60, he said. "The new Bertram is focused more on the customer experience," said Truslow. "We&apos;re going to have a closer relationship with the retail customer." 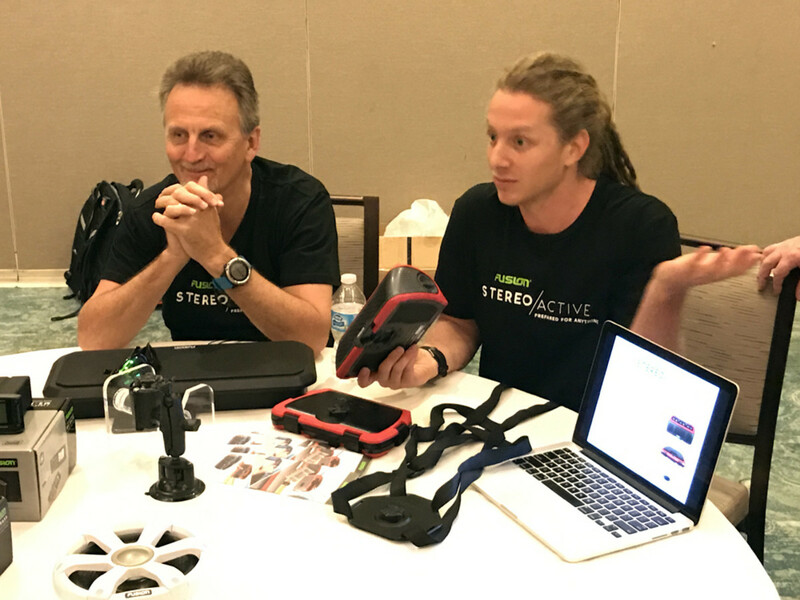 Representatives from Fusion discuss the Fusion StereoActive, a portable watersports stereo. The event gave some manufacturers a chance to show editors samples of their products, such as Fusion&apos;s portable watersports stereo — the Fusion StereoActive for kayaks, paddleboards and other small craft. ACR introduced its AISLink, its first Automatic Identification System (AIS) Man Overboard Beacon (MOB), a locating device specially designed and priced for the recreational and commercial marine markets. Airmar Technology Corp.&apos;s Jennifer Matsis and Jennifer Piper were excited about their new TDT1000 Transducer Tester, which will help electronics dealers and installers trouble-shoot sonar system issues. "Dealers are really excited about this," said Matsis, who has been with the company for 18 years. The product is $1,000 and can be used with its own app, which allows information sharing between dealers/installers and their customers. Matthew Vetzner, vice president of marketing for the Marquis-Larson Group, told editors about the rise in popularity of the coupe-style express cruiser. The company is showcasing its 52-foot coupe at the show. Vetzer also said the company will continue to build more outboard boats for its Larson lineup. 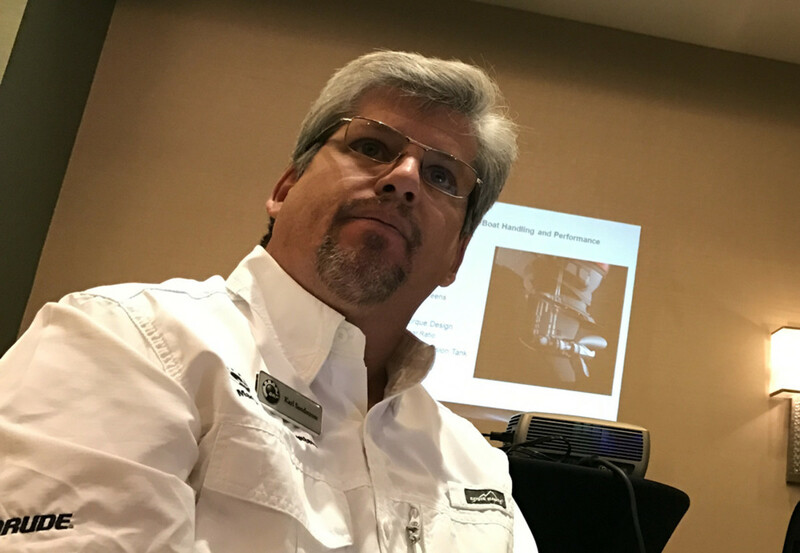 Phil Gaynor, senior telematics product manager for Navico, updated journalists about GoFree, the provider of digital content and services and part of the Navico family of electronics brands Simrad, Lowrance and B&G. It is an affordable hardware system that delivers connected vessel solutions. GoFree Vessel is the web and mobile interface for the connected vessel. Karl Sandstrom, a marine consultant for Evinrude, gave a 60-minute presentation about the E-TEC G2 outboard technology. Karl Sandstrom, a marine consultant for Evinrude, talked about the performance benefits of E-TEC G2 outboards, which use advanced 2-stroke technology with direct fuel injection. The G2 engines are now available in models from 150 to 300 hp. Lower-horsepower models are on the way. “There’s no better way to get complete combustion,” Sandstrom said of the G2’s DFI technology.